Wireframing is a very important part of the design process and there’s a plethora of wireframing tools available out there. But for the serious web or software designers and developers, free tools probably won’t cut it. We’ve partnered with Justinmind to give away a copy of Justinmind Prototyper to a lucky reader of SpyreStudios. Read on to learn how to enter. 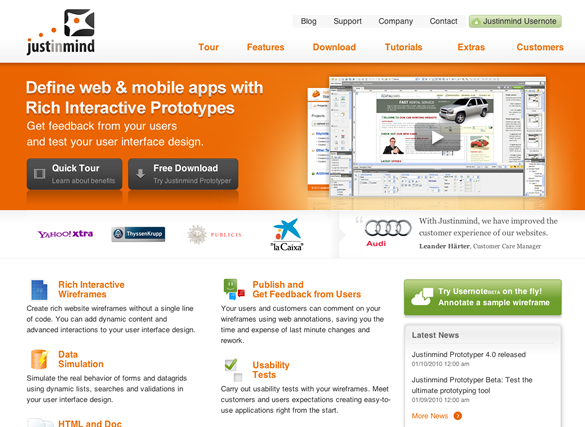 Justinmind Prototyper is a professional-quality prototyping and wireframing tool for OS X. It is usually priced at $495. 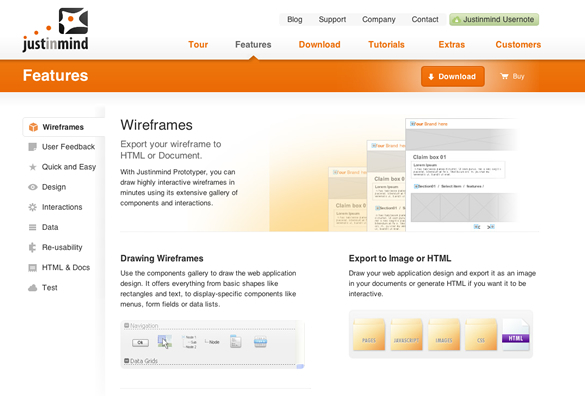 With it you can quickly and easily create functional wireframes, add advanced interactions and simulate web prototypes. To enter the giveaway simply leave a comment on this post (with your real name and a valid email address) and tell us why you would like to win and how it would help your web-design business. You can also tweet about the giveaway, we will be tracking tweets using Disqus Reactions. We will pick the winner using a random number generator. The contest ends on Monday, February 21st, 2011 at midnight (0:00) GMT. The winner will be announced shortly after. I’d love this! I’ve been trying to really define my planning / wireframing etc process as I think it’s the most important. This would really help! I like this tool. Sometime I spend too much time working for nothing, but with JustinMind i will be more efficient with my time and proyects. I want to learn more and more about my passion : graphic + web designing and development. I currently work at a software company as the 1st and only front-end UI developer. It’s a JAVA shop and Not a single soul here prototypes anything outside of screen shots into a power point! This would help me save a bunch of time. More importantly I am building out some applications for photo manipulation and storage accessibility for my not-so computer literate wife, building out prototypes would be awesome to test workflow with her! One of the most important and the most troubling matter in design is being able to show prototypes to our client as quickly as it is possible. Why is it so important? In my work so far, I’ve learnt that client changes his mind in the most unexpected moment, and the probability of changes grows exponentially while you progress with project. So far I’ve been dealing with it by drawing, quick prototyping with html but still it’s not what clients expect. Those prototyping tools are great help to all IxD Designers, Web Designers. I have been looking for a wireframe tool. This is exactly what I need to improve the creative process with the client. I would win to use this tool to share my wireframe project with my contribuitors. It’s amazing how often when offering designs to a client how bogged down the process gets in minutia when all I want to concentrate on is how the page works. Wireframing removes the design layer, allowing me to get the client to concentrate on how the page flows, how it’s setup, how navigation is structured. This prototyping tool would be a great asset and I like what I see so far. Glad to see this new tool. First steps and tries were awesome. It could save a lot of time. I spend about 50% of my time head down in wireframes and prototyping tools. I have tested the trial version of Justinmind Prototyper and can confidently say nothing else comes close – for putting together precise wireframes and prototypes. Tools like this are an essential asset to both designers and developers alike. Apps like this are worth the investment as they save time and money and make it a whole lot easier to articulate and present both a concept, design and prototype. Winning this would be just awesome! Cant begin to let new web designers know how important wireframing is. This would def. help out big time! I’d like to win this for professional-quality prototyping and to gain much experience in prototyping. This tool looks really nice. I am a php developer who has recently been doing more and more page design as well. I’ve been using visio, but it doesnt really do the trick! I ll tell you what me and my small french company hope to win this contest ! Great giveaway. This would definitely speed up the wireframing process. I’m currently using InDesign and I’m really not a fan of it for wireframing. I would love to try this tool as a fan of Adobe and on the constant lookout for a better prototyping tools, all have fallen short. What I love about Justinmind is that I can create a direct relationship from my Workflow to the individual wireframes. Now that’s something! This would be a great way to start off our Internet media company. It’s truly amazing you can offer such great prizes.. I didn’t still have a chance to use paid solutions of this type, therefore very much I want to win, to test such a product. I think that it will spare me the time and misunderstandings with customers. As an Interactive Designer who tries to stay at home and have an office atmosphere here, I am constantly on the lookout for more tools that will help me be efficient, and this is perfect! I specialize in Mobile Application Design and sometimes drawing on paper and telling people how it will work, isn’t ideal.. lol.. And they usually don’t know how to work my paper buttons. This software would be perfect! I’d love to win it because, while I’m doing great in my business, I’m not able to purchase this on my own just yet, and would love to use it. I would totally spread the word about it too, so they should consider me their little ambassador at that point! I am particularly interested to test out the re-usability feature and interactions options. It would be so interesting, relevant and engaging to have a discussion with a client over wireframes that simulate actual behaviors without having to code it. I have clients who want to have the site coded first before they know what changes they would like to see. This tool would be a great way to prevent the excess code that needs to be written before they can test functionality. Wireframing is like storyboarding… it helps define the subject matter withing a well thought presentation. I have installed JIM just to check things around as a good tester and I have to tell you….It got me very good! I used to create “STATIC” wire-frames directly from SMART DRAW Software and they usually it come up pretty good, thank you…but the whole new experience on well designed wire-frame with a navigable features and validations???? Seriously? Please send me a copy for free and help me to avoid the whole “RE-DO” thing from my projects…. I share knowledge of prototyping with students and followers, will share your tool experience if will got one. Seems like you explored a lot of stuff to design useful one. First year in freelance webdevelopment and need all the help I can get to stay afloat! This would be an awesome addition not only for speeding the process up but for presentation as well! Love this! I’ve been looking for decent wireframing tools as I’ve started receiving a lot more freelances jobs and Photoshop is far too time consuming! I’d never heard of Justinmind before this post but had a good look at the website and love the look of it – really like the way it incorporates not only making the wireframes and usability diagrams but also the way your clients can feedback directly to you on it. Looks a brilliant tool and it’s something I’d immediately start to use – good luck to everyone! This program would greatly help me in my designs as I am currently using Fireworks to do my wireframing and don’t get me wrong it works for me, I just find it to be severely limited and not as feature packed as a dedicated wireframing application. So if I won this, the time it takes for me to develop wireframes would probably be slashed in half, if not more. This will improve my life in the prototype stage of every project. I will get rid of all the different apps that I use for generating prototypes. I’d love to have this tool in my arsenal because I’m constantly wireframing websites and applications. Every day I wireframe something new. If I had a tool at my disposal that sped things up, I’d be super happy. Awesome, many thanks to everybody at SpyreStudio and Justinmind Prototyper!